When you purchase a Bliss Tubs walk-in bathtub, you expect a luxurious and safe bathing experience. That’s why every tub we manufacture is equipped with an abundance of standard features you’ll love. Our tubs deliver standard amenities many other walk-in tub companies don’t offer — even as optional equipment. Bliss Tubs walk-in tubs are built to last. Our tub bodies are made of durable, marine-grade fiberglass with a high sheen, gel-coat finish. A high-strength stainless steel frame provides ample support to the floor and seat. Get information about acrylic vs. fiberglass walk-in tubs. Our contoured tub seat and backrest conforms to the natural shape of the body, providing maximum comfort. At 17 inches high, our walk-in tub seats comply with The Americans with Disabilities Act standards, making them an excellent choice for those with mobility issues or disabilities. Our walk-in tub doors are safe and easy to use for seniors and the disabled. Right-hand or left-hand door – Choose the best option for you. Guaranteed leak-proof door – A hydrostatic seal, along with compression from the water inside the tub, guarantees your walk-in bathtub door won’t leak. Ergonomic door handle – Our ergonomically-designed door handle is easy for seniors to use and helps prevent injuries. Stainless steel door hinge – This attractive door hinge offers benefits like corrosion resistance and durability. Essential safety features are included with every walk-in tub we manufacture, so you can experience worry-free bathing. Six leveling feet – Adjustable leveling feet keep your tub level and support door seal integrity. Low threshold for easy entry and egress – Our low-profile, 6-inch threshold makes entering and exiting your walk-in tub easy. Slip-resistant floor – Bliss Tubs walk-in tubs feature a textured floor for slip resistance and added stability. Grab bar – A standard grab bar adds even more stability and helps you avoid falling while using your walk-in bath. Discover these Fall Prevention Basics to help avoid accidents at home. 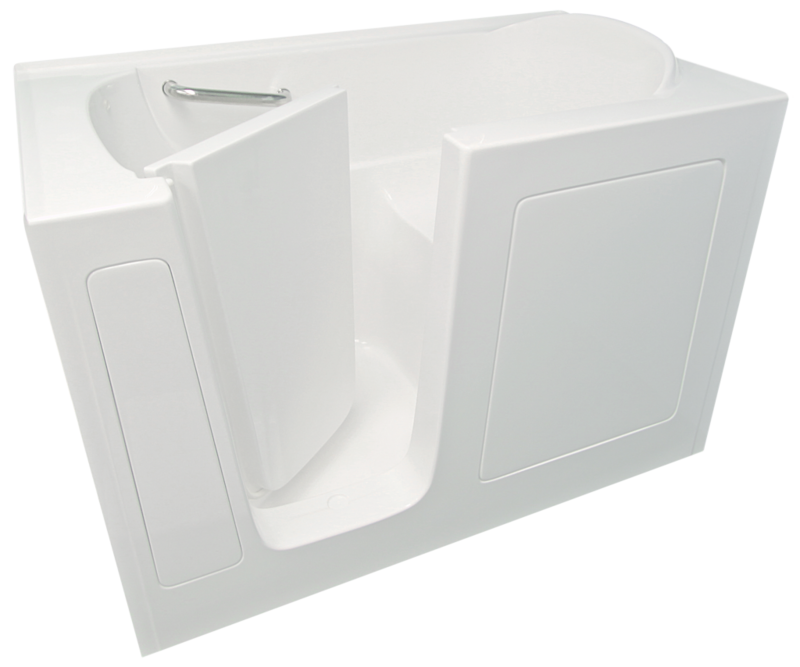 Depending on the model, your Bliss Tubs walk-in bathtub ships with an angled or straight grab bar. Models over 40 inches high feature an angled grab bar. All others come with a straight grab bar. Why? No matter which tub you choose, you get the most ergonomic solution, maximizing your safety and stability when using the tub. Our walk-in bathtubs come standard with a 1½” cable actuated drain and overflow kit that makes draining the tub quick and easy. Plumbing and electrical components are easily accessible when your tub requires service, thanks to two convenient maintenance panels. Every Bliss Tubs walk-in tub also comes with a suction cup your service technician can use to remove the panels. Each Bliss Tubs walk-in tub comes standard with a 5-piece faucet set including a multifunctional, adjustable hand shower piece. 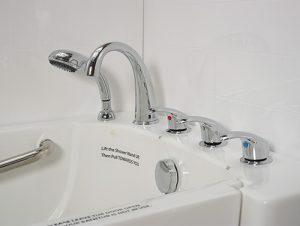 The American distributor, Huntington Brass, which is based in Orange County, CA, also supplies the same faucets to Home Depot. Enjoy a convenient shower in your walk-in tub. Your installer can easily mount the retractable showerhead to the wall.